I have been accused of defacing another user's answer. The answer provided two potential solutions. The second I personally find very good. However the first, as far as I currently understand it, does not work. For some reason the author cannot or does not seem to want to offer instructions on how to to make his first suggestion work. It is a little tricky to get that to compile, but it can be done. If you will delete all your comments that are defacing my answer, and contact me by email offline, and if you will promise not to tell the OP how to do it, I will show you how to do it privately. Is that an appropriate remark to make on Stack Overflow? Are my comments really defacing the authors answer? You're not defacing anything. Comments are for discussion and clarification, and that's exactly what you're after. I think it would've been better for him to just say, "The solution is bad, so I'm not going to post how to do it here and mislead anyone." I'd consider him an authority on the subject (gold tags in the Objective-C and Swift tags, author of related books), so the question becomes, why doesn't he want to elaborate on that part? However, this sort of dynamic messaging is discouraged in Swift. I don't know Objective-C, but I see this kind of behavior in questions about WPF quite frequently. WPF's predecessor, Windows Forms, relied heavily on code that was tightly-coupled to each Form. It was difficult to maintain and near-impossible to test. You can do that in WPF as well, but it is in no way recommended. Almost anyone would suggest using MVVM and data-binding. That's what Matt seems to be saying. Yes, there's a way and with enough effort you'll get it to work, but it's not recommended, so he's not going to waste time showing anyone how and send them down the wrong path. He's willing to tell you how, but he doesn't want to muck up his answer with a poor solution and feels so strongly against it that he's asking you not to share it either. I invited you to submit your own answer and told you I would upvote it and encourage the OP to accept it rather than mine - that was the first thing I said. 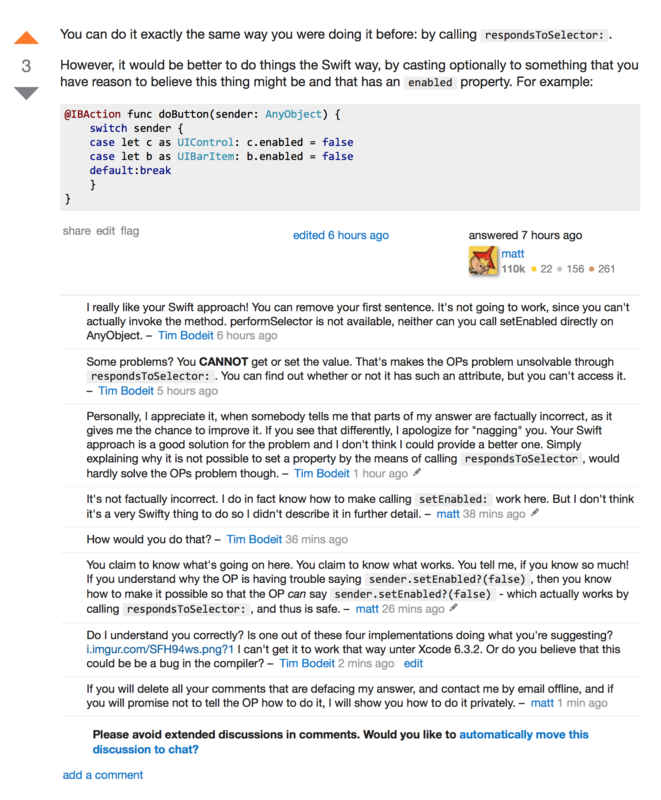 I offered to tell you what I didn't want to tell the OP, namely how to inject setEnabled: completely artificially into the compiler's sphere of knowledge so that his sender.setEnabled? (false) would compile (and work). If you were truly interested in knowledge, rather than in trying to be the boss of me, surely that should have satisfied you. I revised my answer to be more explicit about the fact that respondsToSelector: can in fact be made to work in this situation, and about what I was not saying and why. But I also made it plain from the start that I would not be told what to say and not to say in my answer - especially since I didn't agree with you. In spite of that, as I say, you went on and on, making comment after comment. So yes, I think my answer was defaced, and I found your tone and words throughout to be attacking, rude, peremptory, and dismissive. That I am a human being like yourself - let alone someone with some knowledge of the matter - seems not have entered into the picture. Your motivations, as things unfolded, seemed more and more to be personal and not in line with the educational purpose of Stack Overflow. I would in fact have proceeded to delete my answer just in order to free it from the tail of your comments hanging off it, but a moderator was kind enough to agree with my request that they be deleted. The user asked a question and give the answer in 30 seconds. Maybe it should be marked as community post? I voted to delete this convoluted question. Should I have? How to handle questions that are not useful for future readers?